KielbasaCon 2009 comes to a close. For shame...look at these horrid pictures. 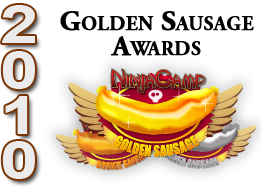 This year's KielbasaCon was so ridiculous that it actually sent all NinjaCamp's daily operations into the shitter! The giant bucket of Kielbasa and the non-stop Korean-style video game playing thrust NinjaCamp into a world of hurt. However...all is not lost! On the contrary...game development has once again picked-up. We're on the fringe of developing the greatest game of all time! In the meantime...stop touching yourself...and get ready for the upcoming details and amazing posts from The Kielbasa Squadron!